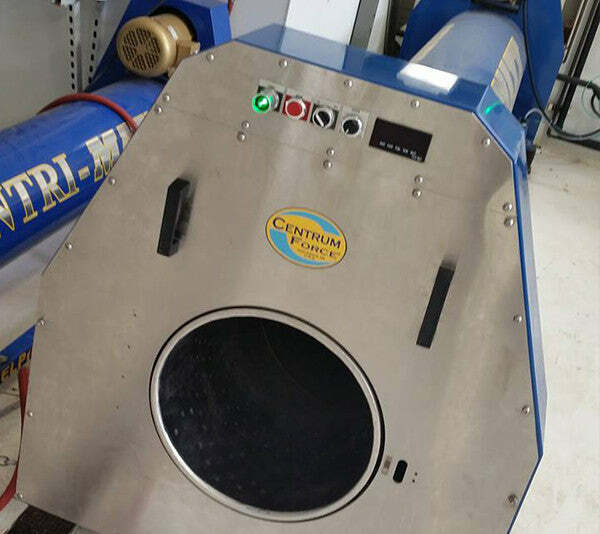 Centrum Force proudly designs and manufactures the most successful, well-built line of rug-wringing centrifuges in the business: the Centri-Maxx®. Leveraging patented technologies, the Centri-Maxx enhances any production rug cleaning plant by removing over 90% of moisture from rugs of almost any thickness in 3 minutes or less. This allows even heavy and dense textiles such as ninety-line hand-knotted Chinese rugs, to be processed quickly and efficiently. The Centri-Maxx is also an exceptional tool for removing urine and other contaminants from rugs. Using a combination of centrifugal force, water irrigation and effective chemistry, contaminants are flushed out of rugs better than any other method! The Centri-Maxx has a variable spin control which enables the rotation speed to be adjusted from zero to 1200 rpm. This adjustability allows the operator to determine which speed is best for processing any given rug. Every Centri-Maxx is equipped with patented shock absorbers that eliminate “walking". Access is provided to enable the operator to rinse the rug with water while spinning, allowing thorough rinsing. This Centri-Max is available with a stainless steel cylinder. The stainless steel model is especially ideal for long, corrosion-free service in heavy rug use plants. Engineered with a perforated design to provide maximum water removal. By removing residual dirt and water that ordinarily flows down into fringes during hang drying, the Centri-Maxx virtually eliminates time-consuming fringe detailing. Just brush out, and you’re done.